Put your mince into a mixing bowl, season well with pepper, a little salt and the dried oregano (about a heaped teaspoons worth, although not too heaped!). With your hands, mix together. Add a little mustard (preferably dijon mustard) and mix in - you will only need about a teaspoons worth. Make the mixture into meatballs - all of the same size - then put into a pre heated oven at 200. They should only take 15 minutes to cook. 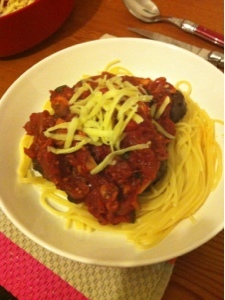 You should have around four or five meatballs each, if there are alot more, the extra's can be frozen for another time. Pour your tinned tomatos into a pan, add your sliced onions and mushrooms and season with the dried Basil (about a level tablespoons worth). If you are using fresh basil, you would put in about a handful. Add about a teaspoon of puree to thicken the sauce (you can add another if needed) and allow to cook. In the meantime, put your spaghetti in into some salted water and begin to boil. Stir the sauce every couple of minutes to ensure it doesn't burn or stick to the saucepan. Once the sauce is cooked, add your diced garlic and stir in. 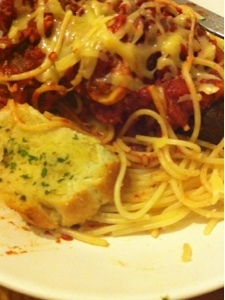 Serve the spaghetti onto your plates then place the meatballs on the top and cover with the sauce. Season with a little fresh grated parmesan and serve with garlic bread if desired.